If you’re looking for value stocks, and exclusive access to value-focused hedge fund managers, check out ValueWalk’s exclusive value newsletter, Hidden Value Stocks. Benjamin Graham is widely considered to be the Godfather of value investing. His book first, Security Analysis was one of the first publications on to the topic of security analysis, and it remains essential reading for value investors even today. However, before Graham published this seminal book, he was a prolific author and lecturer. His early work gives us great insight into how this legendary figure worked and the way he analyzed securities. In 1919, Graham wrote a series of articles for the Magazine of Wall Street comparing different securities at the time. One such article was titled, "Northern Pacific Outstrips Great Northern." Within the piece, Graham compares two railroad concerns, Northern Pacific and Great Northern. The article starts with the Dean of value investing noting that on April 4th, 1919, "Northern Pacific sold higher than Great Northern -- for the first time probably in ten years." The reason why he opines has something to do with the "great railroad personality" of James J. Hill, whose "genius" greatly helped the company's "erstwhile ascendancy" over its peer. "Practical interest will center chiefly about the relative movement of stock earnings and stock prices. Here the graph shows plainly that the market has lagged somewhat in reflecting Northern Pacific's recent substantial gains. In 1909 N. P. earned 1.62% more than Great Northern, and sold at practically the same level; in 1917 it earned 2.66% more and its price averaged about 6 points lower." So, the purpose of the article is to answer the question of whether "Northern Pacific is not now a better investment purchase than Great Northern?" The answer to this question is made complicated by the fact that both companies were, at the time, under government control and had been since 1917 as part of the war effort. However, Graham notes that "the word has gone forth that the railways are to be returned to their owners -- willing or unwilling -- at the end of 1919." "For years it has been apparent that Northern Pacific has been spending much less on the upkeep of its equipment than either Great Northern or the jointly owned C. B. & Q. In 1918, for example, with the same traffic on both roads, Great Northern expended $745,000 (or nearly 79) more for this purpose than did N. P. In 1916 the difference was $1,704,000—in other words, 12.41% of gross for Great Northern, against 10.47% for N. P. From this incriminating evidence at hand, one would straightway conclude that N.P. 's operating expenses have been held down by neglecting its cars and locomotives. Yet on further investigation, it transpires that Northern Pacific's upkeep costs per unit of equipment are actually higher than Great Northern's; and that the lower expenditure in the aggregate is due to its owning a much smaller number of engines and freight cars. But how one asks—can Northern Pacific handle as much traffic as the parallel line, when it has 20% less freight capacity and 10% less locomotive power? Surely it must hire more equipment from other roads, or lend less to them. Wrong again! In 1917, Northern Pacific's net income from the hire of equipment was $1,237,000 against only $511,000 for Great Northern." The answer to these questions, as it turns out, is that Northern Pacific has a "40% larger haul for its traffic" meaning that the firm can keep its equipment in use a larger proportion of the time and "thus get along with a smaller quantity of freight cars." So, the two companies functioned quite efficiently outside of government control. Under government control, their fortunes varied greatly. Northern Pacific hardly prospered, but it managed to turn a profit. Meanwhile, Great Northern turned out to be a "very poor proposition for Uncle Sam returning a deficit of no less than $15,775,000." "This is an element of such importance, however, that it is remarkable that it is hardly ever referred to-if at all-in analyses of the company's status. 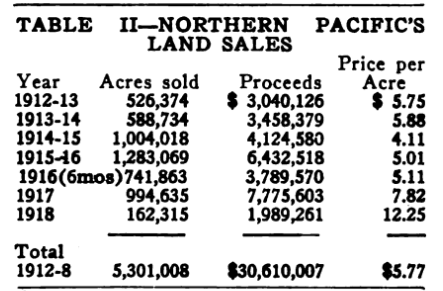 Table II shows that Northern Pacific has been enjoying a steady income of large proportions through the sale of its farm lands, which are located principally in Montana and Washington. On Dec. 31 last there remained 4,800,000 acres available for sale. Assuming these holdings have an average value of $6 per acre in 1918 the land brought $12.25—there is here a "hidden asset" worth $30,000,000, which is steadily being converted into cash. The funds so realized are applied to the retirement of the prior lien bonds and so increase the net income available for dividends. Great Northern's land holdings, however, are entirely negligible. now aggregating only 101,543 acres." "For on the basis of its operating and financial results we have shown that Northern Pacific is entitled to sell on at least as high a level as Great Northern -in fact should command a better price. If to these considerations is added the value of its land holdings-amounting to certainly more than $10 per share-it should then seem only a question of time when Northern Pacific, for ten years the "under dog," shall once more claim the ascendancy."